We were responsible for engineering review and design coordination necessary for county permit requirements, solicitation and assessment review of subcontractor and vendor bid proposals, execution of contracts, and coordination of the owner's furniture and kitchen equipment vendors. A new 2,800 s.f. 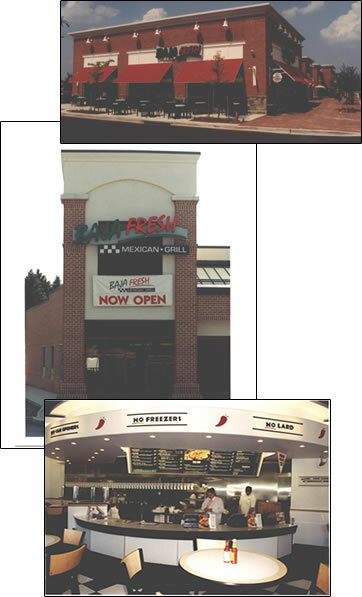 restaurant for one of Baja Fresh's first prototype facilities on the East Coast. Another local Montgomery County area 2,500 s.f. expansion. The project was completed in parallel to the site developer's completion of the shopping center shell construction. This site conversion was over 3,000 s.f. and because of the existing site capabilities, Baja Fresh elected to provide outdoor seating similar to their California locations. This requirement made timely structural and fire protection adjustments to the existing building necessary to expand for the outdoor seating areas.